Since its original publication in 1993, Real Estate Opinion Letter Practice has been the standard text for the preparation and negotiation of real estate opinion letters, a subject which has gained increasing attention by proliferating state and national bar reports and the courts. This updated third edition addresses the extensive developments which have occurred since the last edition published in 2009 and summarizes the "best practices" that have emerged from the various opinion reports and customary practice. The original version of this book has been frequently and favorably cited by many of the subsequent bar reports that are analyzed in this edition. 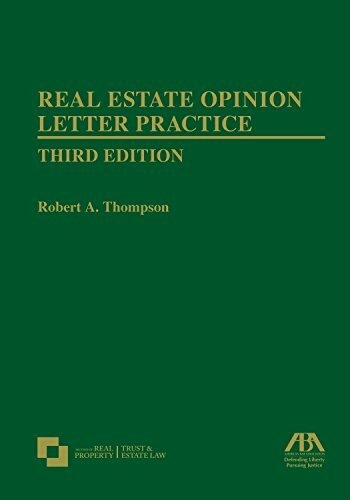 Written by Robert A. Thompson, widely respected in his field for his comprehensive knowledge and research in this area, this authoritative volume identifies and analyzes the common characteristics and differences of current real estate opinion practice. Thompson provides guidance and training for younger lawyers, to whom the preparation, review and negotiation of opinions is often delegated, as well for as more experienced legal practitioners. Chapter 2 provides the most detailed and comprehensive analysis yet published of the theories and standards of legal liability and professional responsibility which govern the preparation and enforcement of all legal opinions, a subject of increasing concern to lawyers, law firms and their professional liability insurers. The book also identifies the due diligence process and quality control procedures that should be undertaken to support the issuance of real estate and business law opinions alike. By providing the full text of virtually every state and national bar real estate opinion report, many of which are previously unpublished, Real Estate Opinion Letter Practice makes readily accessible the reports that articulate the local customary practice that is applicable to increasingly common interstate secured loan transactions. For the first time, all of these reports are contained in a single published volume in both the text and the accompanying CD-ROM.